What If Makeup Actually Healed Your Skin Instead Of Damaging It? The vast majority of makeup is produced as cheap as possible to ensure as much profit as possible. I don't like putting "cheap" on my face, and I especially don't like doing it all day, every day. Normal makeup contains talc as a cheap filler, which can clog and dehydrate the skin. This is exactly the opposite of what we want for our facial skin. Talc is referred to as a "mineral", but there is mineral makeup and then there is MINERAL makeup, as you will see. Dehydrated and crepey skin doesn't look healthy and even worse when covered with makeup. Wearing bad makeup that damages your skin will mean you need more of it to hide the damage. This creates a negative feedback cycle. I don't believe makeup is about hiding our faces, why should we have to hide our faces!? Wearing makeup is about highlighting our features. Doing it with a product that heals and nourishes your skin is simply the smarter thing to do. 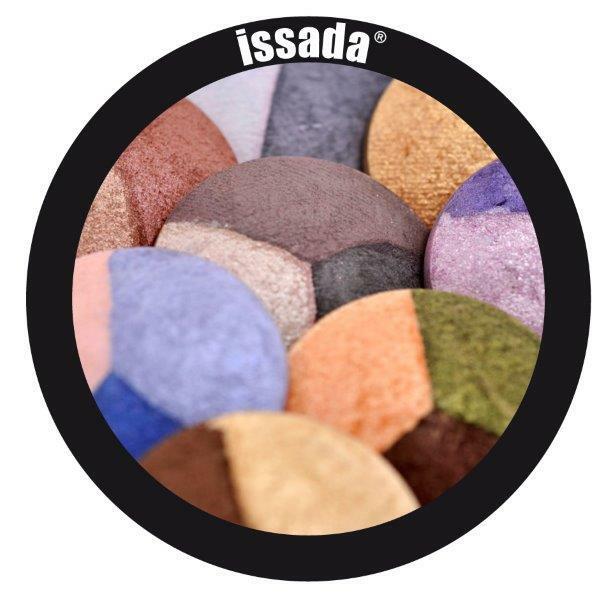 We have partnered with Issada cosmetics, which produces the best makeup range I have ever used. It's feels amazing and everyone that uses it tells me the same. Since I have started using the Issada lipsticks my lips are no longer dry. I've stopped using lip balms as my lips are moist and don't dry out. There is a reason even celebrities in the US have started using it. It's a game changer, and a whole new thing! Your old makeup is like comparing a horse and cart to the latest BMW. For starters……it's what's in it. The Issada products are bursting with clinical grade Vitamins, Antioxidants, Minerals, Botanicals, Proteins and Collagen. These are ingredients that actively benefit the skin. It contains no talc….zero! We offer in house facials with our skin technician, and we use an incredible skin care product that compliments Issada. You can read about it here. It's all about a holistic image. Your hairstyle, clothes, style, colours, makeup and skin care all have to work together. If you're going to spend money on your skin, and various procedures, then settling for a cheap makeup simply undoes all that effort. It's a waste of money, time and works against your goals. Issada makeup is so incredible that plastic surgeons recommend using it after surgery because it helps to heal the skin. Yes….it's healing, all day, every day! It acts as a sun block so you don't need to apply creams under your makeup, and it doesn't dehydrate your skin. You won't have that feeling of wearing paste on your face. It's a perfect combination with our O Cosmedics range. Issada is perfect for sensitive skin as each particle is spherical on a microscopic level. This means is won't irritate sensitive skin. This beautifully packaged, hand-made product is illuminating and reflective so your skin never looks dull. The product is freshly poured on order and doesn't spend a long time on shelves causing it to become old or get that stale smell about it. We professionally colour match the makeup to your skin tone so you never look like you’re wearing a mask. In addition to all of this the brushes come with a lifetime guarantee and none of the product is tested on animals or sourced from China. This is an Australian made product which is also a based right here in Brisbane. Come in and try it out, you won't be disappointed.